March 30, 2015 – A dual view of Saturn’s icy moon Rhea marks the return of NASA’s Cassini spacecraft to the realm of the planet’s icy satellites. This follows nearly two years during which the spacecraft’s orbits carried it high above the planet’s poles. Those paths limited the mission’s ability to encounter the moons, apart from regular flybys of Titan. The two views of Rhea were taken about an hour-and-a-half apart on February 9, 2015, when Cassini was about 30,000 to 50,000 miles (50,000 to 80,000 kilometers) away from the moon. Cassini officially began its new set of equatorial orbits on March 16. The views show an expanded range of colors from those visible to human eyes in order to highlight subtle color variations across Rhea’s surface. Images taken using clear, green, infrared and ultraviolet spectral filters were combined to create these enhanced color views. In natural color, the moon’s surface is fairly uniform. 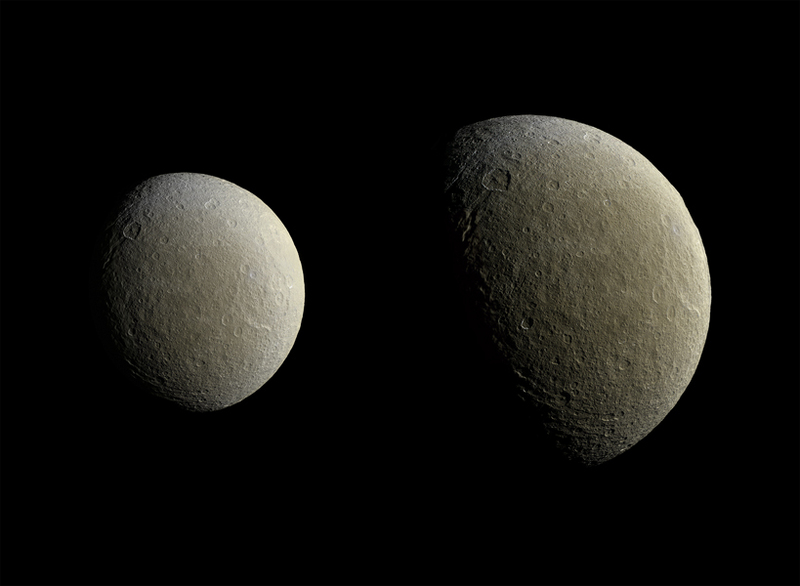 The image at right represents the highest-resolution color view of Rhea released to date. A larger, monochrome mosaic is available in PIA07763. Cassini’s orbit will remain nearly equatorial for the remainder of 2015, during which the spacecraft will have four close encounters with Titan, two with Dione and three with the geyser-moon, Enceladus.